Cashews are a food you can truly enjoy while also doing your heart a favor. Try blending them into a nut butter that can go from snack time to the main meal. 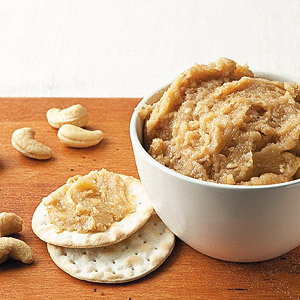 Use any type of salted, roasted nut to make various versions of this recipe. Pulse cashews in a mini food-processor until paste-like. Add water and oil; pulse until mixture is creamy. Add sugar and salt; pulse to incorporate. Refrigerate in an airtight container for up to 2 weeks.